Step 1: Determine the exit date of the previous school year. 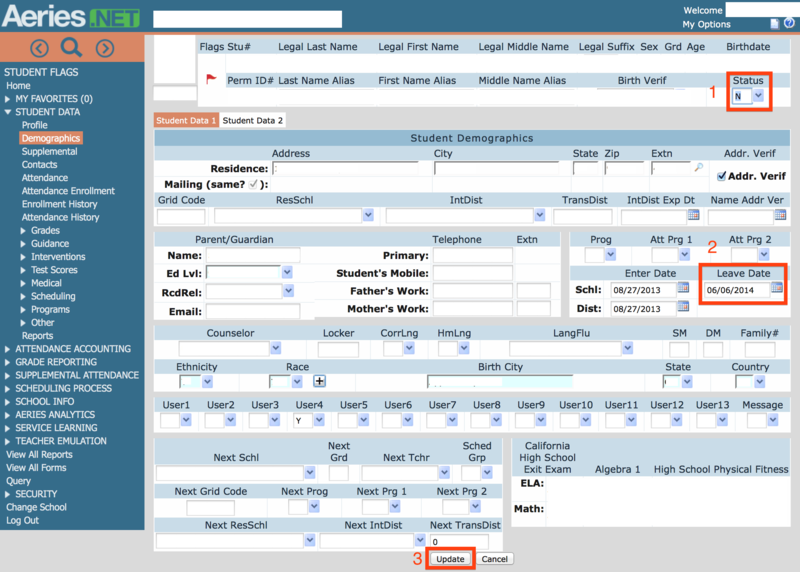 Step 2: Open the student record in Aeries.NET and click the change button at the bottom. Step 3: Change the status code to "N" for No-show. Step 5: Check the 1) Status and 2) Leave Date and click 3) Update! Step 5: Check changes to CALPADS Extracts. This article will explain how to properly exit a student in Aeries.NET that is a no show. Before we start changing things, we need to be very clear about the type of student it was that did not show up. Returning student no-show: This student attended the school in previous year, was enrolled on the last day of school before summer and was expected to return after summer. 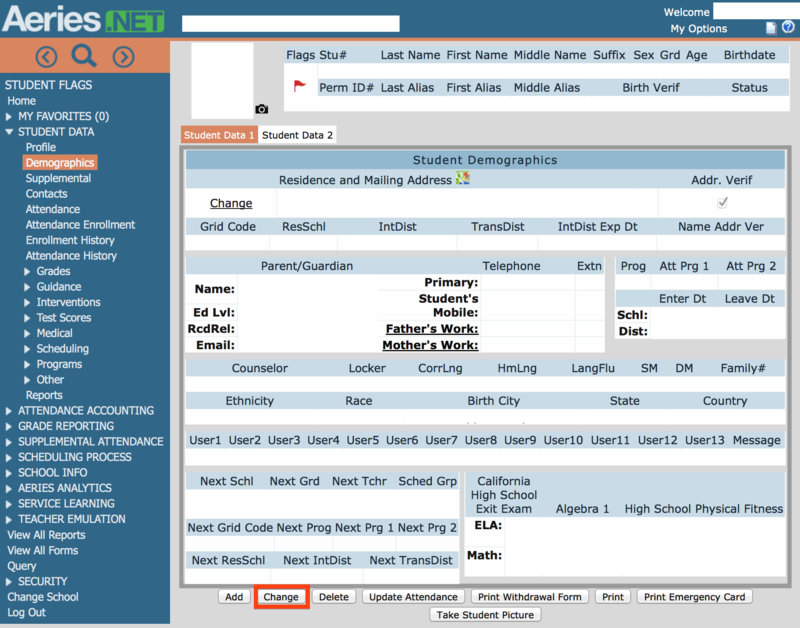 New student no-show: This student went through the school’s enrollment process as a new student, but never showed up to the first day of school. This student has no prior enrollment history at the school. This article will walk through the process for exiting the returning student no-show only. This should be the last day of the previous school year if the student was supposed to return but did not. Step 3: Change the status code to “N” for No-show. You can change the status code like the screenshot below. Once the “N” is selected, you will be prompted to drop schedule and locker information. 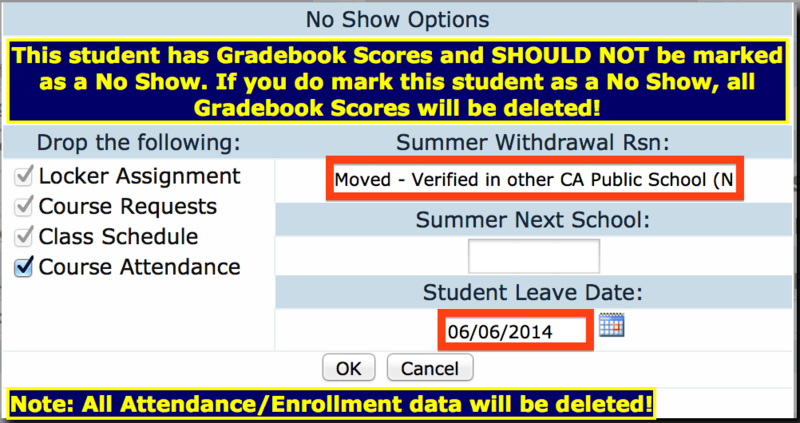 Additionally, you will be able to select the appropriate exit code in the field entitled “Summer Withdrawal Rsn:” along with the Student Leave Date which should be the last day that the student attended the school. Press OK when complete. 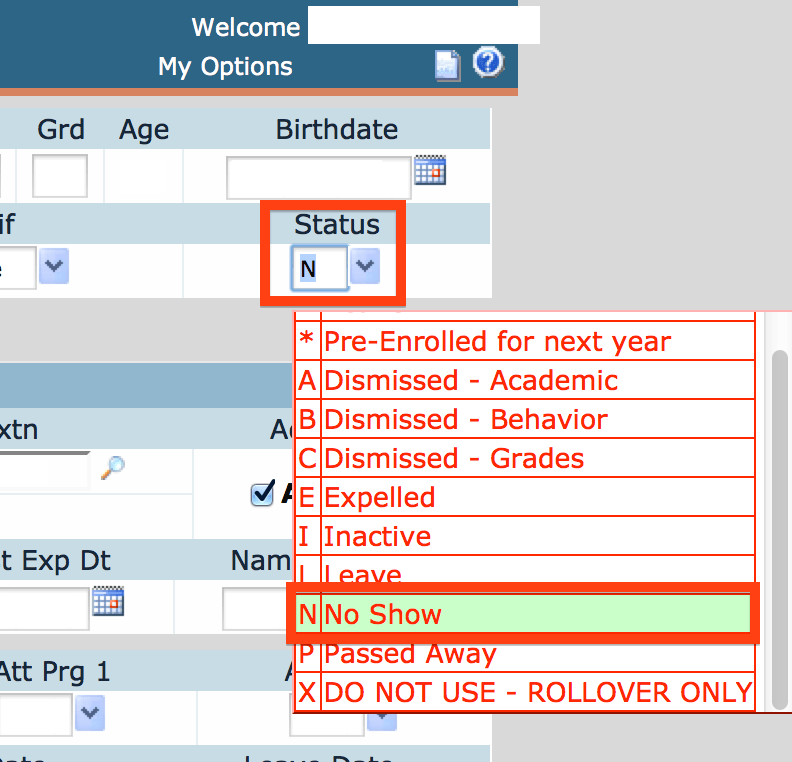 The change to the exit codes will result in changes to the way that Aeries will export the SENR for SSID enrollment. Check with your CALPADS Coordinator that the expected values are exported so that there are no discrepancies when it comes time to certify reports! Note: As you are now exiting students in this process for the previous year, they may dissapear from the SENR file altogether. It is likely up to the CALPADS Coordinator to compensate for this.